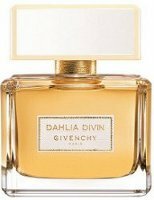 The question Angie asked yesterday in her review of Guerlain Shalimar Souffle de Parfum — at what point does a flanker stray so far from its parent that it ceases to earn the family name — is not the question I asked about Givenchy's new Dahlia Divin. Dahlia Divin may or may not be a flanker to Dahlia Noir, anyway,1 but if it is, it doesn't have all that much to live up to (with the usual apologies to its fans, I did not think Dahlia Noir was destined to become an enduring, beloved classic). Dahlia Divin is presented as a fragrance for a modern-day goddess. It "lets you embrace your inner Golden Goddess" and "inspires us to want to be better, reach new heights and live life to the fullest".2 All of that can't hurt, I suppose, although I have a feeling the gown Alicia Keys wears in the commercial and print ads might be more effective than the fragrance — but of course, if you had the money for the gown, you wouldn't be looking for your next perfume among the mainstream designer options at Macy's. Dahlia Divin starts sweet and fruity; there's the plum listed in the notes but also citrus and what smells like berry-apricot jam (the notes say "golden fruit"; also jasmine, white flowers, patchouli, vetiver and sandalwood). It's on the warm side, and it gets warmer as it dries down into a jasmine-ish blended floral with a woody musky base, still quite plummy, and darkened a bit by some modern (i.e., scrubbed clean) patchouli. It has more emphasis on the florals than did Dahlia Noir, and it's full-bodied enough to stand up to cool weather (and by the same token, I would find it a bit heavy for typical August weather, only we're not having typical August weather this year). It's slightly dark, almost but not quite full-on into oriental territory — you could call it a woody floral or a modern chypre or a neo-fruitchouli, take your pick. It has a soft, slightly powdery finish with a whisper of vanilla, only lightly sweet.3 After a very long wait, it does get somewhat bit earthy, but not more than that. Verdict: I called Dahlia Noir pleasant, wearable, competently done and not unsophisticated, and I'd say the same of Dahlia Divin. Neither scent is wildly distinctive, but to my nose Dahlia Divin is prettier, and it's not quite so faceless as Dahlia Noir. I don't think it's likely to attract huge numbers of perfumista fans, and it didn't do anything to change my mind about Givenchy as a fragrance house,4 but if you like warm, plummy florals and want something up-to-date, it's certainly worth a try. The quick poll: have you smelled anything, good or bad, from the upcoming crop of fall department store launches? Do tell us about it! Givenchy Dahlia Divin is available in 30 ($65), 50 ($90) and 75 ($110) ml Eau de Parfum. 1. A proper flanker would presumably be called Dahlia Noir Divin, plus, the bottle is different, and from what I've seen the brand is not presenting it as a flanker to Dahlia Noir (although admittedly the latter is often true of fragrances that I would definitely classify as flankers)...so you could argue Dahlia Divin is merely the second in a series, or you could argue they were just too lazy to come up with a new name, or that they hated to let the name Dahlia go to waste after Dahlia Noir didn't sell as well as they hoped. 2. Quotes via Givenchy Beauty at Facebook. 3. The base, actually, isn't altogether different from Dahlia Noir, but then, it's also not altogether different from a gajillion other department store fragrances: clean patchouli + clean vetiver + synthetic musk + bland woods + a drop of vanilla and a smidgen of powder. Decorate with a few flowers and fruits, bottle it and you're done. 4. Givenchy hasn't made anything I really wanted to buy since 1999's Organza Indecence, although I haven't smelled a single one of the recent L'Atelier de Givenchy fragrances. Plum is a note I enjoy so I’d likely give this a sniff if a chance comes along. It doesn’t count specifically as a fall release but I did get to try a sample of the new Natori. It isn’t anything like the previous one and while it is nice enough, it has an entirely different, more traditional fruity floral feel. The heart does have a nice tropical floral note in it, but even this is really dominated by the very sweet fruity opening with a lot of pear and some other tropical fruit whose name escapes me at the moment. I’m looking forward to the new Bottega Veneta and am somewhat curious about the new French Kiss by Guerlain, but other than that I can’t really think of anything else I’m really dying to try, sadly. Everything coming out seems to involve oud in some way, shape or form and I’m so over oud. That sounds about like what I expected after reading the press stuff on Natori. Shame they couldn’t find a way to keep the old one in production, this one is clearly geared younger. And will add…clearly they put way less effort into the Josie packaging. Haven’t sampled yet, but the next dept store release I’m trying is AdP’s Rosa Nobile. Didn’t care one way or the other about the Gelsomino or Magnolia versions, but do like Iris Nobile in both the edt & edp iterations. And on the N-M site, Rosa is actually available in a smaller, 50 ml size. I will certainly smell that one too, although ditto on the Gelsomino & Magnolia. Reminds me I have not worn my Iris Nobile in ages! the last thing Givenchy produced (outside of the Les Mythiques reissues) that I wanted was Oblique Rewind in the early aughts. I should dig that one out and give it sniff, though I remember it being a cool weather comfort scent. I have smelled nothing new–I am mildly interested in smelling (though probably not buying due to the prices) the Bulgaris named after gemstones. And Bottega Veneta Knot. I just can’t work up the drive to drive anywhere during the hot rainy summer. Was that the cherry one? That was a fun scent, I’d forgotten about it but it used to be popular on the MakeupAlley board, some years ago. I don’t remember it all that well, just that I thought it was fun but never did buy it. Just tried this one last week. It got very soapy on me about 10 minutes in (think Camay soap) and then the dry down was warm, close to skin, but nothing special. At least the soapiness was gone. I wanted to like it, especially since, just like you, I haven’t liked a Givenchy fragrances in ages, and this one sounded promising, bottle is decent. But no go for me. It’s not the big solar floral that one might expect, given how it was advertised and all. Oh interesting, it wasn’t soapy on me at all…but then, I don’t always mind soapy anyway. I thought it sounded promising too, and in all truth it’s a pretty good fragrance — it could be way, way worse. Your comments are very interesting to me. I was so lukewarm about the Dahlias released before. I have a few of the Les Mythiques – but again – those are all about 7 or 10 years old now, and just repeats of their own classics (including Organza Indecence). I think this is why I was so razzled, as I said yesterday, about the Dahlia Divin – it’s been a long time since I’ve been impressed by a Givenchy, and I was really hoping. I will still try and test this one b/c you never know – it may fill a void I have in my collection for some more everyday types. It maybe a step up than the usual dreck – some of the newer releases are getting not so bad, but not FBW to me. The Terre Fraiche is really quite nice…would love to have a coffret with little bottles of Terre in all the concentrations. Good luck with your patchouli! Looking forward to the AdP and Bottega Veneta as mentioned above. I do like the new Hypnotic Poison edp more than the edt. And I sniffed that new Marc Jacobs daisy one in-store-cute and summery but not something I’d buy. That other summery Bottega Veneta one-the last released- was kinda nice but also kinda strange on skin.. I agree about the summery BV – it got kind of waxy for me. OK, but not FBW. Good to know about the HP! Want to try this. Asked to see if they had it at a dept. store, they said they didn’t even hear about that or the Secrete version. Like they tried to say they didn’t exist.:p. I’ll give this one a try but doubt there’s a bottle in my future. I like a few Givenchy perfumes but none of their more recent attempts have thrilled me. Ysatis was a huge favorite of mine in high school and college. And I always liked Eau de Givenchy…that was my signature scent at one time. I like Organza and Organza Indecence, the old Ysatis and Extravagence d’Amarige which is a lovely green floral- nothing to do with Amarige. They’re a pretty random house though- catering for vastly different markets ie the Play range..
Givenchy, another house that went downhill, imo. Thanks for the review of DD Robin. It would be easier for me if you totally dismissed it. Because then I could just move on, but I think I’ll give it a fair chance. I’m going to try and test this when I can, but I had my own ideas about plums and sandalwood and vetiver, and I doubt this will get there. It may be very nice for the masses, and a step towards more comlexity than usual these past 10 years or so for fancy department store frags, but it may not be FBW for me. Hey, at least there is no oud in there, right? The last new fragrances that I tested were the Le Carven, which I thought was pretty OK, but again, not FBW or true love or lust or anything. Ditto with the La Panthere, which I was actually really trying to pursuade myself to like more. I am looking forward to testing BV Knot, but am not expecting to love this one. They really hit it out of the park with the original and the eau Legere, so I’m feeling they may be out of luck now. The last mainstream fragrance release that I died over was the Cartier Baiser Vole edp, so that tells you about how current I am! I was interested in trying/buying the Terracotta that came out in the spring, but I blinked and it was already gone, so there is no love lost there. You know, I wouldn’t call it any more complex than other mainstream fragrances. It’s just a bit prettier than many. But I didn’t smell the base and think, ah, sandalwood and vetiver…I smelled the base and thought oh, another one of these clean-dry-patch things w/ powder, which I am starting to think of as neo-fruitchouli (the patch is too soft to call it a true fruitchouli). I’ll go and find my LP sample and see what happens. Commenting slightly off topic, but also a bit on topic: I’ve noticed that many folks have a negative association with soapy. I really love soapiness in perfumes! Guess it’s linked to loving a good soap. When it’s time to start hinting for birthday presents (round about NOW), I always say: life’s too short for Lux. Any recommendations for soapy perfumes? (I don’t mean the musk lite laundry variety). Prada Man & Hermes Caleche both came to mind right away. Wish we had a “soapy” tag to jog my memory but we don’t. So many of the old aldehydic florals, like Caleche, are soapy, and so are many orange blossom scents. Sometimes Iike soapy, sometimes not. Depends. Soapy orange, no, Chanel 5 vintage-y soap, that is ok.
A soap rec would be a soapy orange…like Tauer Orange Star….or Guerlain Flora Nerolia. Try an orange blossom fragrance. My last soap overload was Pretty Machine by Kerosene … very pretty linden and then all soapy orange blossom. While I do have a bit of a … ummm …. soap fetish (just look at the stash in my hall closet — yikes! :-)), I do not like soapy perfumes on my skin. Not really considered a soapy perfume at all, but one of the many facets of Timbuktu that I love is that it’s dry down hints at hands that have been gardening or in the woods, washed briskly with a creamy soap. I tried Calvin Klein Reveal, and loved it. Definitely will purchase a fb at some point in the future. I would be interested to see what you think of it. I haven’t tried it yet, but will try to do so soon! Love Your blog and Your relaxed professional attitude! Ok, on the wrong side, I am a fan of Dahlia Noire which surprises me to! It just is different than many out there. On the right side but, is Organza Indecence still on the market? Can’t find it anywhere in Austria. Even Organza is almost gone from around here. Actually, Givenchy doesn’t sell as good around, must say. OI can still be found here (Macy’s department store has it, among others), but I’ve been wondering for how long! And this Divine one sounds to me little unexciting…. No more plummy fragrances! It is a struggle to get anything which does not smell like a cheap bakery! I recently sniffed Dahlia Divin, in Bloomingdales. It was pretty, but totally nondistinctive. It kind of reminded me of a less complex version, of some popular perfumes from the 80’s and 90’s. As a whole, modern Givenchy fragrances tend to be duller than dirt. My full bottle purchase of a 2014 release, was Narciso Rodriguez Narciso. That was an instant love for me, and I get loads of complements when I wear it. 2014 seemed to be a fairly weak year for perfumes. Many of the major mainstream releases were overhyped, and fell flat on their faces. Tom Ford Velvet Orchid was pretty disappointing, and way too floral. I absolutely hated Bottega Veneta Knot, as it just smells like Pine-Sol. Victor and Rolf Bonbon was, unsurprisingly, banal and trashy. Dolce and Gabbana Dolce was boring, and did not really smell like anything. Cartier Le Panthere has a beautiful bottle, but the scent is too fruity. Burberry My Burberry was bland, and overpriced. I have yet to smell Calvin Klein Reveal. That one sounds pretty nice, and like something I might enjoy.